If you like to hike and spend time in the wilderness, then Red River Gorge Hiking should be at the top of your vacation bucket list. The Red River Gorge is a scenic natural area that is located in eastern Kentucky, within the boundaries of the Daniel Boone National Forest. It is known for its many natural stone arches, its bizarre rock formations, and its breathtaking sandstone cliffs. This area is a hiker’s paradise, featuring over 100 arches and multiple scenic trails. A landmark that is designated as a National Archaeological District and a member of the National Register of Historic Places, this is a great place to take in some history as well as the local flora and fauna. Red River Gorge has over one hundred native species, and is a fantastic place to spot wildlife like hawks, owls, deer, bobcats, and foxes. You’ll also likely spot gorgeous wildflowers, towering maples, and other common plants. Red River Gorge hiking is some of the most spectacular in the country, with dozens of different trails to traverse and explore. 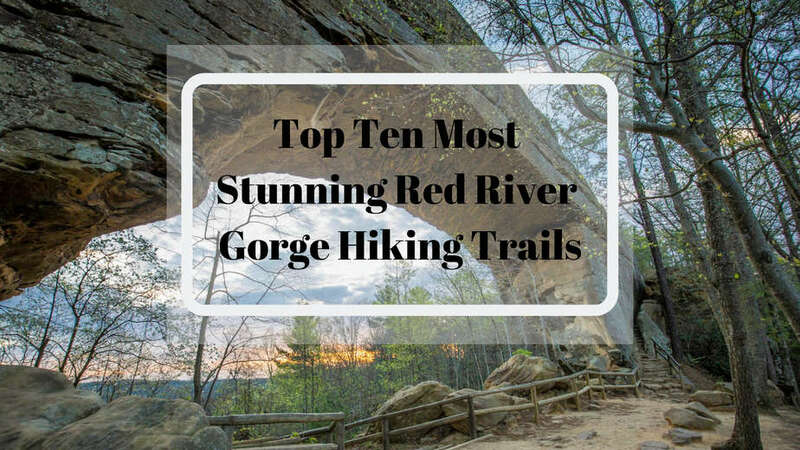 If you are planning a trip to the area this year, consider these top 10 Red River Gorge trails to give you the best overview of everything the park has to offer. This gorgeous hike is easy, and will take you less than half a day to hike. If you have a few hours to spare, it’s a great spot to visit. This is especially true in the early spring when flowers are in full bloom, or in early fall when the leaves are beginning to change. Upon beginning the hike, you will quickly reach a natural arch in the forest. If you already have the Silvermine Arch on your agenda, you should also tack on the Hidden Arch trail. Both trails can be accessed from the same parking area, making this a great trip for hikers looking for a longer trip, or for those wishing to do some overnight camping. The Hidden Arch trail is also a great option in the early spring or fall, and only takes an hour or two to hike. The trails are well-marked, and despite the befuddling nature of its name, it is remarkably easy to find. The hike back to the parking lot is exceptional, offering you a lovely overlook just after you pass the arch. This hike offers a nice and easy stroll as a loop walk that is less than a mile in total. You’ll reach a gorgeous natural bridge before returning to the main parking area, where restrooms are available along with other amenities. It takes less than half an hour to take in everything this hike has to offer, making it a good choice for hikers who are pressed for time, or for those looking for a quick pit stop during their travels. Indian Staircase may only be about 3.5 miles, but don’t let the short distance fool you – it is still relatively tricky to traverse. Not a designated “official” trail but instead a sandstone cliff, this trail is not for the faint of heart. It consists of pockets of rock that are sculpted by the acts of wind and water into an almost-vertical cliff. You will need to do a lot of balancing and rock scrambling on this hike, so make sure your legs are in good shape and supported by good hiking boots. You should not attempt to hike Indian Staircase alone, and always use extreme caution when hiking it. Don’t leave your topographical map or compass at home for this hike, as you may need to use them to navigate your way. The trail can be hard to fine, as it is unmarked. You’ll get it to it just past the Bison Way Trail Parking Area. You’ll have to cross several streams before making a hairpin turn where the trail sits to the right. 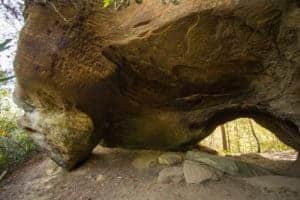 There are other notable landmarks on this trail, including Frog’s Head as well as the largest rock shelter in the gorge (it’s larger than a football field!). On its own, the Indian Staircase is a difficult day hike. While it has magnificent views, the hike itself is advanced. Even though the scramble is short, it can be tough to navigate this trail and will likely prove to be a challenging (yet rewarding) experience on its own. That being said, if you’re interested in going for more, there are several offshoots from this trail that allow for excellent hiking. You’ll need about four to six hours to enjoy the Indian Staircase alone, but if you’re planning on camping or spending a full day, here are some suggestions. The Indian Staircase hike can be pursued with an optional ending. Instead of turning back around the way you came, you can navigate on unofficial trails to reach the Adena Arch instead. This arch is absolutely gorgeous, and provides for a slightly shorter hike instead of the regular Indian Staircase trail. Another option is to follow the trail another six miles to Cloudsplitter. This makes for a very long hike, but Cloudsplitter is a gorgeous hike that takes you high into the air. You’ll need to use ropes to climb it, or you can climb up the other side. There is a small cave along the way that you can walk inside, and the views from the top of Cloudsplitter are, as the name implies, absolutely breathtaking. This option ends up being about a ten mile hike, and is not for the faint of heart. You can camp at the top of Indian Staircase, which is a popular option for many who choose this longer trip. This trail, located near Valeria, Kentucky, features a waterfall and is a great choice for hiking, trail running, or even camping. It receives light foot traffic, making it a good choice for a quick out-and-back trip. You will cross multiple creeks, so it’s a good idea to wear waterproof shoes and to be prepared with a change of socks and shoes if necessary. While this trail is gorgeous at any time of the year, keep in mind that if you visit during an exceptionally dry summer, particularly later in the seasons, there’s a chance that the waterfalls won’t be overwhelmingly spectacular. Watch the weather forecast carefully, and plan your trip accordingly. 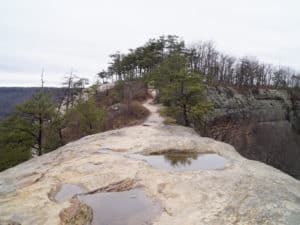 This trail is one of the easier options in the Red River Gorge area. It is partially paved and loops about 1.5 miles, providing a nice day hike with exceptional scenery. 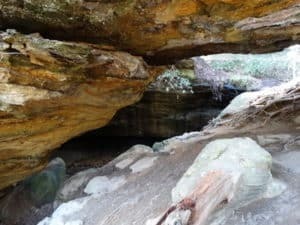 Because the trail is located in the Clifty Wilderness, it tends to be less crowded than some of the other more popular trails in Natural Bridge State Resort Park. While the trail is short, it descends quickly, meaning you have to also ascend about 250 feet before returning to your car. 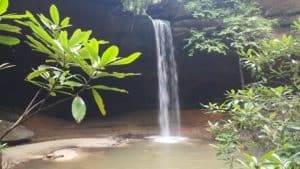 The best and most noteworthy part of this trail is Creation Falls, a waterfall that juts out of the gorge about half a mile in. Another quarter of a mile later, you will arrive at Rock Bridge, which you will actually hike underneath. This bridge is made entirely out of natural rock formations, and has a creek flowing through it. It’s the only arch of its kind in the entire Gorge, making it a notable stop on your weekend hiking trip. It takes less than a couple of hours to hike, giving you plenty of time to stop and enjoy the waterfall. If you’re looking for a longer trip, consider adding the Turtle Back Arch. This will require you to hike along an unmarked trail, but it does not require any difficult hiking. It does have some moderate scrambles, so a good GPS and adequate footwear are necessities. This trail is challenging, spanning 7.2 miles one way. It is not for the faint of heart, nor for the beginning hiker. It showcases the best of the best of the Gorge, bringing you past rock shelters, over massive elevation gains, and through a number of gorgeous geographical features. You’ll pass through scenic overlooks, cross over a babbling brook, and even traverse a dense forest. The trail’s most notable feature is its swimming hole, dotted with huge boulders and filled with clear water that is most refreshing after a hot hike. This trail is short and sweet, offering an immediate descent into the Right Fork of Chimney Top Creek. The trail is well-maintained, bringing you to a ridge that is affectionately known as Pinch Em Tight. The trail stops at the Sheltowee Trace, allowing you gorgeous views of the hillside and neighboring arches. 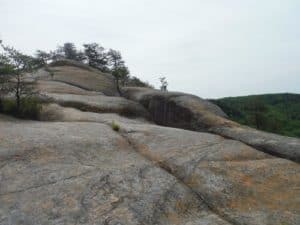 Auxier Ridge is one of the more challenging hikes on this list, but it’s well worth the burning calves and aching glutes that will come as a result of the trip! Through this trail, you will make your way to the top of a gorgeous ridge. At the top of the ridge, you will have panoramic views spanning 360 degrees. 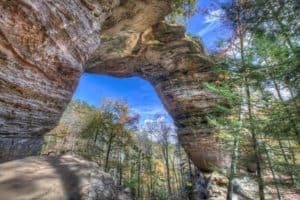 You will be able to see a number of other Red River Gorge’s notable sites, including Double Arch, Courthouse Rock, and Haystack Rock. 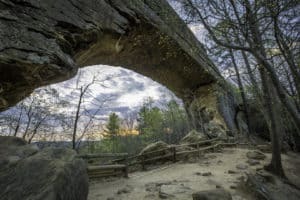 If you’re looking for a longer hike, you can also add on offshoot trails to areas like the Double Arch, Courthouse Rock, Star Gap Arch, Arch of Triumph, and Andrew’s Double Arch. Some of these hikes exist on gravel roads, making it easy to hike but not quite as exciting. If you choose to hike to Double Arch, you can even take advantage of one of the park’s rare opportunities for you to climb on top of an arch. Double Arch has stairs carved into the rock on its right side. 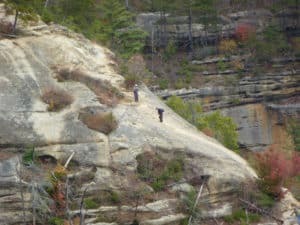 This hike is one of the most popular in the Red River Gorge. There are longer and alternatively shorter routes as well, allowing you to enjoy a hike here even during cold winter days. You’ll need to spend about three to six hours to enjoy the hike, so make sure you bring a lunch. Grey’s Arch is another feature that you can scramble up, but be careful, as there are no stairs carved into it as with some other arches. Less than two miles in length, this enjoyable trail is a great spot to take the kids. It is filled with history, traversing over an old logging road before you have even hiking a single mile. Just before you reach the first mile marker, you will come to a fork in the road. Although the official trail veers to the left, the trail to the right brings you to a small, abandoned cemetery with a handful of centuries-old graves. The trail also brings you to multiple rock shelters and even a unique rhododendron tunnel. 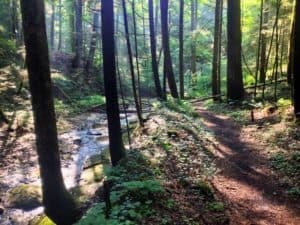 This trail intersects with Swift Camp Creek Trail, making it a fantastic addendum to a longer hike or even a quick jaunt as a stand-alone trip. If you’re headed out in Red River Gorge, you’ll need to make some considerations regarding your hiking and camping equipment. 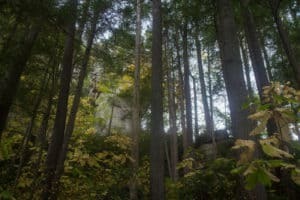 There are many steep areas in the gorge, and many people often fall to their deaths in this area because they don’t wear appropriate hiking shoes or exercise caution when traversing the trails. The best time to visit the Red River Gorge are definitely in the spring and summer, when weather won’t have a major impact on hiking plans. There are multiple Red River Gorge cabins, bed and breakfasts, and other places to stay, with multiple Airbnb rentals in this area that can cost you less than $20 per night. If you do decide to camp, make sure you research the weather conditions thoroughly. You’ll need to bring plenty of camping gear, including your tent, tarps, sleeping bags, and food. And while the weather is fairly consistent during the summer months, temperatures can easily fluctuate fifteen to twenty degrees (or more!) at night, meaning you’ll want to bring plenty of extra layers. Because this area is so remote, it’s also a good idea to familiarize yourself with the area before you travel. Research the trails in which you have an interest in hiking, and find out the best time of the day to do so. Bring along maps of all Red River Gorge trails, too, so that you don’t have to rely on your cell phone for navigation when wireless reception might be poor. When all is said and done, preparing for a Red River Gorge hiking trip should be one of the most exciting times of your life – besides, of course, the trip itself! 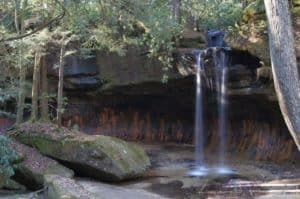 Consider these Red River Gorge trails and enjoy the experience of a lifetime. Oh, and don’t forget the camera!